Ms. Leola McNair 94 of Lumbertion transitioned to rest eternally on March 30, 2018 at Duke University Medical Center in Durham. 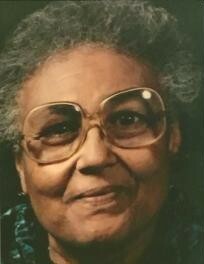 Ms. Leola McNair was born February 12,1924 in Rowland, NC. She entered into eternal rest on Good Friday, March 30, 2018 in Durham, NC. She was born to the late Mr. Harold McNair and Mrs. Lillie Bell McNair. Ms. McNair received her early Christian experience at Providence A.M.E. Zion Church. She accepted Christ as her personal Savior and her faith sustained her throughout her life. Ms. McNair was educated within the church school by Providence in her early years up to the Eleventh grade. In addition to her Parents and Stepmother, Mrs. Callie, she was preceded in death by her five siblings, Eva Mae, Curtis, Catherine, Carolyn, and Larnice; six sisters, Thelma, Ressie, Cora Jane, Pearline, Leaner, Henrietta; six brothers, Ralph (Raz), Kay Curtis, Clemmon, Augusta, Willie, William; six sisters-in-laws and six brother-in-laws. One son-in-law, Ricky Cromartie; One grandson, Calvin Darral McKinnon. Ms. McNair leaves to cherish precious memories; a loving daughter, Rev. Bernice Cromartie; three sons, James Kay McNair (Juanita), Howard McNair of Lumberton, NC and Ray Lee McNair of Raleigh, NC; 13 Grandchildren, 33 Great Grands, 8 Great Great Great Grands and a Host of Nieces, Nephews, Cousins and Friends.